High-performance cooking on wheels. Built of heavy-duty stainless, the Wolf 36" grill cart houses a 115-volt rotisserie for succulent roasts and poultry and an infrared rear burner that starts cooking the moment you switch it on. 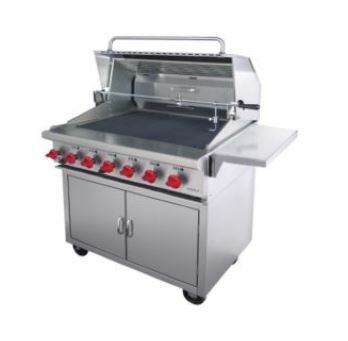 Equipped with your choice of either four or six grill burners. Two side burners are available for sauces and chili.